Questions about training your dog to be a Service Dog? Please call our instructor, Robin Crocker at 603-939-2041. All classes and clinics taught by Robin Crocker, who has been training service dogs since 1995. She has been a puppy raiser with both NEADS and A.C.T.S. and is currently the Chairman of the Board of Directors and Head Trainer for A.C.T.S. Robin is the owner of Telling Tails Training Center and is currently teaching therapy dog classes and other advanced level classes. IMPORTANT: Individuals interested in training their own service dogs should understand fully what the process involves. 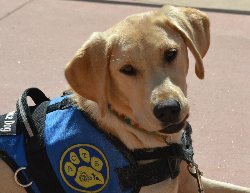 Most organizations take two years to train a service dog. During these two years, puppies go through extensive socialization and public access training. In addition, they learn to do tasks specific to their final partners' needs. Training is done by professionals with years of experience. Training young puppies is not always easy. Individuals who wish to train their own dogs should consider both the mental and physical stamina required to take two years raising and training a puppy to be a service dog. In addition, persons training their own dogs should be prepared to rehome dogs that are not suitable for public access. Internationally it is accepted that half the dogs that start the process of service dog training are deemed inappropriate for public access, and are released from programs or rehomed. This work is not for every dog. If you have not selected a puppy, you might consider asking a professional who has been involved in service dog training for assistance in your selection process. Do not depend on the opinions of breeders and shelter workers. While these people are well meaning, they are not dog trainers and have not had any experience with the required traits of a service dog. If you already have your dog, you need to take a very good and objective look at their suitability for the work. IMPORTANT: If you are unsure if you qualify for a service dog, please feel free to contact me directly to discuss this. Federal law has very specific requirements for service dogs and their handlers. Emotional support dogs are NOT service dogs and have no rights under the law to be out in public places that generally do not allow dogs. The abuse of service dog status is currently a very "hot button" topic and you need to be sure you are very clear on your rights under the law. To ignore these laws is illegal and there are serious penalties. Seizure Alert and Diabetic Alert Dogs: Please note that this class does not cover the training of seizure alert or diabetic alert dogs. If you dogs are already trained to these skills and you need assistance with public access manners, that would be appropriate for this class, but we will not be covering any methods or techniques for teaching seizure or diabetic alert skills. PTSD Dogs: Please note that dogs for PTSD or any other psychiatric disability MUST perform a task that cannot be performed by their human partners without the help of a dog. Simply providing comfort does NOT qualify a dog as a service dog. If you have questions about this requirement please feel free to contact me. This class is for adults over the age of 18 who have a physical or psychiatric disability and wish to train their own service dog. Over time, Robin will cover all aspects of service dog training, including task or service dog skill training, and public access training. In addition, Robin will provide information regarding public access rights and responsibilities as governed by the Code of Federal Regulations and the Americans With Disabilities Act. Prerequisite: Pet Dog 101 & 102 or an equivalent positive reward based beginner obedience class, and permission from the instructor. For puppies under the age of 4 months Puppy Kindergarten is highly encouraged. All applicants must fill out this application form. Students must purchase an 8 class punch card and may attend any 8 classes they wish. Students do not need to attend 8 sessions in a row. Each student must register on our Service Dog mailing list so they will receive any information on cancelled classes. We will try to cancel classes the day prior, but classes may be cancelled up until noon on the day of the class. Students should check for cancellations prior to attending class. These classes are NOT appropriate for dogs that are growling or barking at people out in public. This behavior is serious and requires a more individualized approach to training. Instructor: Robin Crocker, Head Trainer, A.C.T.S.